My article, "Breaching Fortress Europe: By Any Means Necessary: TheComplications of African Migration to Europe" was first written for the conference: "African Refugees and Migrants at Europe's Door, on March 7 and 8, 2016, at Duke University. I was at the time living in in Gottingen, Germany, where I was a Senior Research Fellow at Max Planck Institute. Being in Europe opened my eyes to the plight of refugees in a new and different way, especially since some Germans thought I was a refugee, and I received the kind of treatment believed to be deserving by them. It was odd to also be a Senior Research Fellow at Max Planck--the only reason I was in Germany--and to be treated with the respect that was believed appropriate once I stepped into the Institute. The experiences of my time in Germany, and of crossing borders, from Germany to the UK, the US, and back were also interesting, since my color meant that people assumed I was a refugee in some instances. The American passport was read to mean I was African American by the border authorities, and this probably made my border crossings less onerous than for many others who may have been refugees. 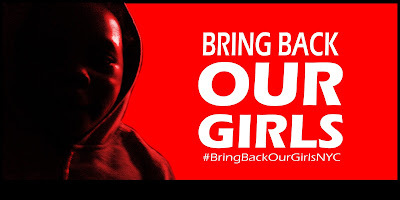 l did some research in Bremen and London, which involved participant observation, interviews, and focus group discussions for my ongoing work on gender, power and leadership in the African-Initiated Church in Nigeria and her Diaspora. The research gave me more information and data on the lives of the African members of Eternal Sacred Order of the Cherubim and Seraphim (ESOCS) in both cities. This part of my research ended up in the paper I presented at Max Planck, and will also appear in my book whenever it's completed, but does not feature in this article. The updated article is now online. It's one more building block toward Issue 9 of Ìrìnkèrindò: a Journal of African Migration, which I already told you is a labor of love. There's heartrending news on African migrants in Europe and along its borders. My article attempts to analyze some of the circumstances that we see unfolding. It also complicates and contextualizes African migration to Europe. Look out for the final piece: the editorial. It's coming soon. MOVEMENT OF THE PEOPLE. A very painstaking rendering, this painting is a mixed media painting comprising of leather, jute bag, melted plastics, cowrie shells, canvas and acrylics. 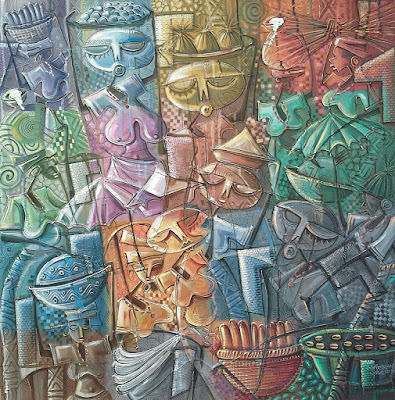 Numerous strokes of interwoven colors also came into play in this painting that was recently made in 2016 by Gbolade Omidiran. The size is 36 by 36 inches. Poverty is a peculiar problem among so many rural village dwellers. As such, the property accredited to a fully grown man could just be a sack load of his belongings and two chickens. In situations like this, migrating becomes the order of the day, probably in search of a better life. This painting titled the movement of the people depicts a group of villagers migrating from one community to another. Each one carries the property that they could easily lay their hands upon, setting out for a new and better life. 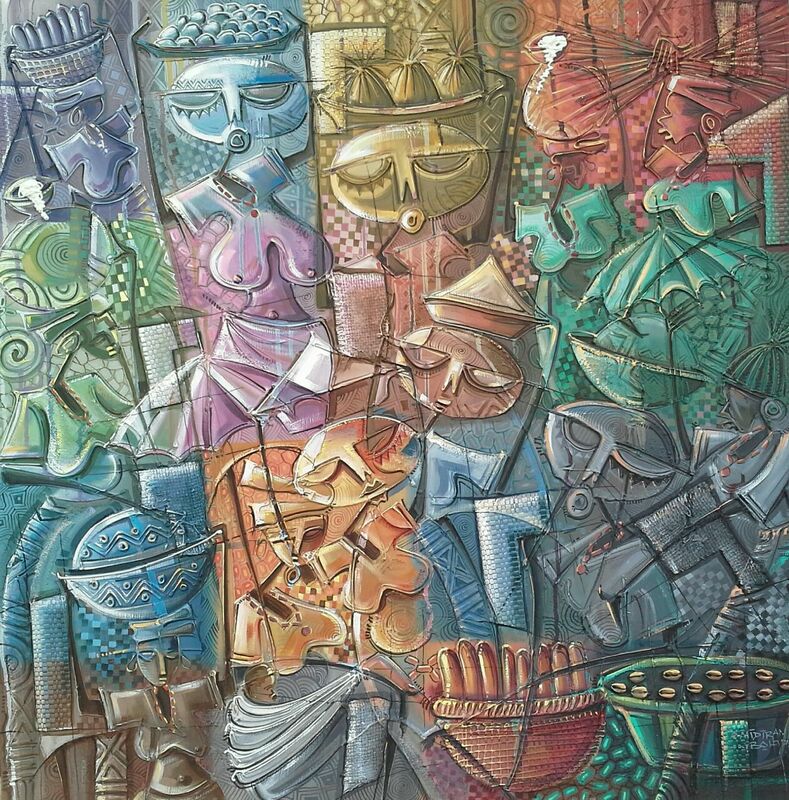 Paul Gbolade Omidiran had his art training at Obafemi Awolowo University Ile- Ife, Osun State, Nigeria, where he received his B.A and M.F.A degrees in 1995 and 2000 respectively. He has eight solos and several group exhibitions to his credit. Gbolade has exhibited in Lagos, Kenya, Germany, London and U.S.A. In 2000, he set up a private studio where he now works as a full time studio artist. He has also executed a lot of commissioned artistic projects. Over the years, he has explored to advantage the use of mixed media having established a magical balance between painting, sculpture and graphics. 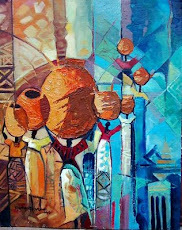 Gbolade is a member of Society of Nigerian Artists, married to a lawyer and blessed with children. He can be contacted at Omidiran Gallery no 25, Ede road along Obafemi Awolowo University Ile-Ife.